poetry films turn texts towards the visual. Thereby, many films make use of text as an image, showing an excerpt or even the entire text, hand written letters, fonts, text patterns or simply visualize the text through the use of subtitles. The presence of film and electronic media has massively expanded our perception of static, printed letters. Since the late 19th century, dynamic words and texts in motion were established and and by now have become a common viewing experience. Be it a moving text banner in urban space or an animated GIF on a screen – texts and glyphs in motion are more familiar to us than ever before. Since the very beginning, the film medium has been part of this evolution. In the first decades of film history poetry films didn’t make use of texts in different ways than any other film genres but soon began to show an experimental approach towards the written or printed text in motion. The »font film« (»Schriftfilm«) is a specific type of text based poetry films. Here, the text or font is not necessarily dependent on its poetic meaning but can function solely as a graphic entity. The ZKM in Karlsruhe presented its various forms and tendencies in a major exhibition in 2013. Of course, not every »font film« is a poetry film. On the other hand, many poetry films deliberately work with the visualization of words and texts. The knowledge and expertise of calligraphers, typographers, layouters, graphic, book and motion designers is fundamentally important in order to fully understand the means of graphic visualization of a time-based text. Following up the exhibition at the ZKM, we will focus on questions which are related to the meaning of a text and the decisions and ways that lead to visualizing it in a certain audiovisual form. Thus, we aim at bringing together the views and motivations of writers, filmmakers, typographers and graphic designers. 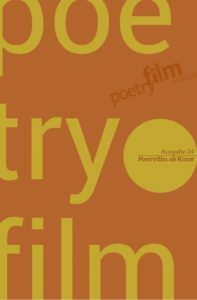 We are looking for essays dealing with the following questions: Is a text in a poetry film purely functional and underlines or explains the meaning of sound and image? What is the difference between a font in a book and a font in the form of a moving image? What kind of different or additional meaning(s) does it create? What is the relation between a text and other elements that appear in a film – or together in a frame? To which extent does this relation turn the text into a protagonist of the film itself? Why does a filmmaker choose a particular font? What is the relation between sound, voice-over and other visual elements? How is reading, watching and listening being balanced? Like in the past two editions we are interested in a direct connection to the process and practice of filmmaking. We encourage everyone interested to send us their contributions (up to 10.000 characters and without footnotes if possible) until the end of July 2017. This year in May, we will announce the Weimar Poetry Film Award for the second time at the backup_festival in Weimar. We will take this occasion to organize related events and focus on the topic in more depth. We are very much looking forward to your contribution!